There’s lots of climbing in Yosemite. There’s lot’s of hiking. There’s iconic hiking. 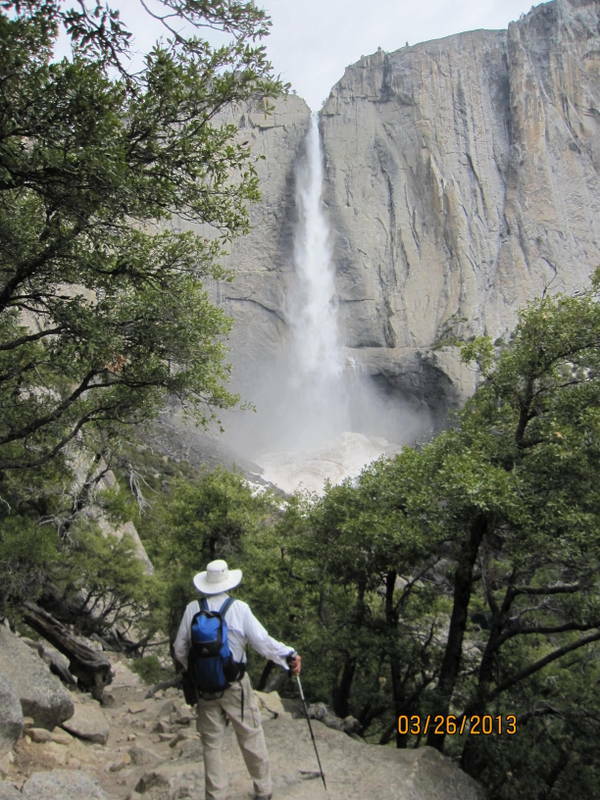 The Upper Yosemite Falls Trail has it all. It’s THE hike. Here’s our account of the Queen Hike, see Mark Twain for the real dope. It’s day three of our stay in Yo. We’ve recovered (mostly) from the trauma of a lost credit card and a replacement card is winging/wheeling in via UPS. We decide on a 9 AM departure from camp for a no-sweat strenuous hike. We bike 30 minutes to the trailhead, lock up, strap up, and trail up just behind a group of 25 guided teen hikers. We’re able to pass them on the first of the switchbacks. The trail has some dirt/gravel grade, some stone/dirt steps, but the most unique feature are the cobblestone ramps. The cobbles are rounded and may be sandy and require a lot of attention in placing your foot. So we switch-back up a rock-fall for an hour. Steep. I’m mostly huffing like a steam engine but we make good time. Lots of hikers on the trail. We pass some. Some pass us and the rest we get then is sweet. 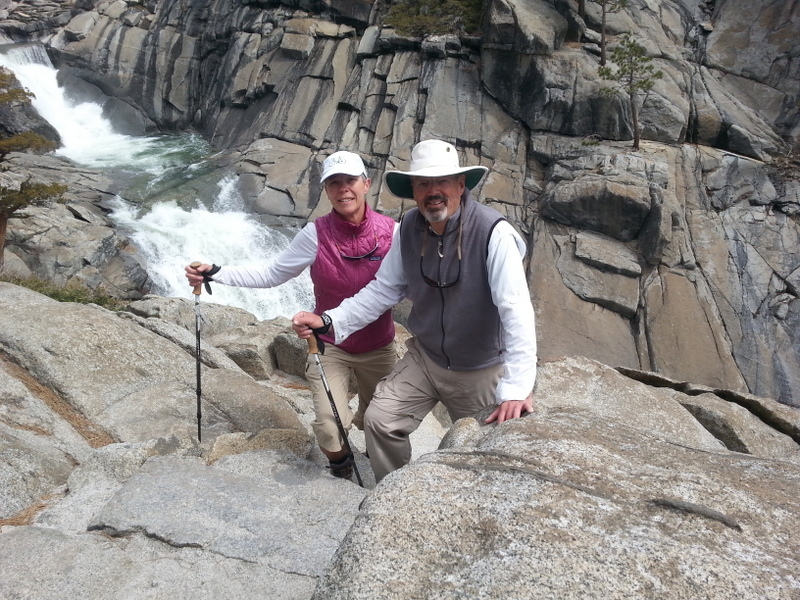 Now a 45 minute traverse to the north, still climbing, to the base of the falls. Tired. But the first sight of the falls inspires. There’s a big cone of ice at the bottom waiting for Spring thaw. Mist and thundering billows. We give back 400 feet of climbing descending and approaching the falls. Now another hour of switch-backing up, up, up. Thin air. Up. Up. Catch breath. Drink. Take 5. Up. Huff. Up. Now we can see the top. We walk the dome over to edge. Top of Yosemite. 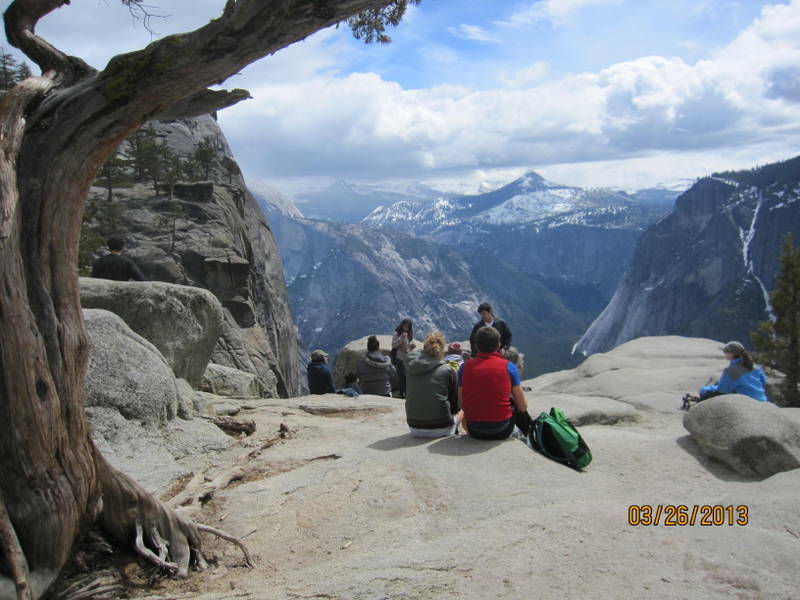 Hikers strewn across the boulders slurping the view. We descend toward the creek’s notch to see the top of falls. Rush. Plunge. Back on top. Lunch. Hamstring cramp so drink drink drink. Boulders fill up with hikers. What? Back the same way? Seriously? Gotta admit to being a little bubbly starting down. Drunk on the view and getting there. Telling people ’10 minutes and you’re there.’ Then I get another hammie cramp. 5 minute stretch. Down. Down. Cramp. Stretch. Down. Judy scampering down by comparison but not like the young people that scamper down and run up. The cobble stretches demand careful foot placements going down. An hour on the first switch-backs. 45 minute traverse. An hour on the second set of switch-backs. Endless. Down. Turn. Down. Turn. Now fresh faces coming up with pleading looks. Finally down. 5 hours 45 minutes total plus lunch. Not bad for an old guy on a recommended 6-8 hours ‘very strenuous’ hike. 7.2 miles. 3000′ gain. 9% relentless slope. But I (we) paid for it with days of sore muscles. We cycle back Yo Village to have a celebration beer. Ahhh. Just wow! At the view… and at your being able to do it!! !